Let these terracotta watering stakes will take care of your plants while you're away. Wondering who will water your plants while you're on vacation? Have trouble remembering to tend them when you're home? Just let these ingenious garden stakes take care of them for you! Each ceramic stake is specially designed to release just the right amount of water into the soil via recycled wine or plastic bottles, making your gardening endeavors a little bit greener. 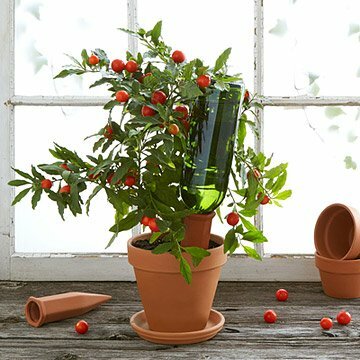 Create a reservoir with the inverted bottle of your choice, attach it using the drip-free adapter, and the terracotta stakes will quench your plants' thirst on your behalf. As your plants absorb moisture from the soil, the stakes will automatically release water directly into the soil, rather than on the surface, ensuring that root systems receive an adequate drink. Made in China. Filled wine bottle will water plant for approximately 7-10 days depending on the plant and environmental conditions. Typical 12oz plastic bottles, when filled, will water plant for 5-10 days depending on the plant and environmental conditions. Larger plastic soda bottles (2 Liter), when filled, will water plants for between 14-21 days depending on the plant and environmental conditions. I may buy this again depending on recipient's feedback. Have not heard back from gift recipient so I don't know if they found it attractive and useful. I would buy this product again for myself and as a gift. I was very happy to see that both my potted tomato plants were just as green and healthy 5 day's later as the day I inserted them. I would use these items on all my indoor plants to. Used in outdoor plants while I was away for a week. They worked wonderfully. Love my plant nannies! Don't have to worry if I'm away or unable to care for my potted plants. It's a great product! These were perfect for my granddaughters new porch. She lives in a area of Texas that gets spotty rainfall and she travels a lot for work so the plants on her porch were anything but adding to curb appeal of her new house. These are the perfect solution! I loved it so much I bought them a second time! Loved it. I have a vineyard so wine bottles add a great accent.